Coffee doesn’t do rain justice and so I sip hot chocolate instead. Which gets me wishing for a country house with a porch. These days though, I am content with an oversized window of trickling raindrops. The world seems awash in misty rain. The buildings from my window are mantled in gray that any tinge of color stands out. Now I suddenly notice the yellow building and begin longing for shiny umbrellas or children in flashing raincoats and boots. I fancy the smell of rain. I used to imagine it as the earth breathing out, the damp ground sighing. Even the sound of the rain tugs at me: a subtle shh. I sense everyone quiet, easing off, going by the day slowly, remembering to sit by porches and sip their cups of steaming chocolate. Taking rain checks. Reading a book. Walking with deliberate slowness. Sighing, melancholic, misty, pining for the promise of romance. Imagining chance meetings of bumping into a beautiful stranger under the rain. Or kissing under a red umbrella. I sense time. It moves leisurely. The rains remind me of a small pocket of bushes in our backyard. There was a dent in the ground and the waters collected into little pools over shiny pebbles. I used to pick pink and red hibiscus flowers, squish them under the rain, and make the oil I needed for playing house. Somehow one never forgets how muddy wet feels like. 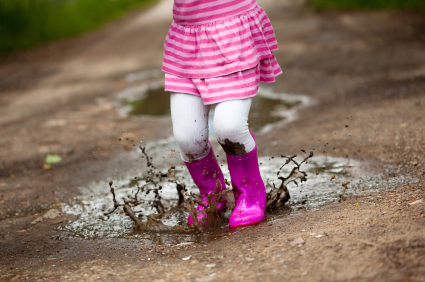 I used to tap-dance in the rain, sloshing around barefoot in gray puddles. Or stay under rain gutters, waiting for a waterfall. I still walk under a drizzle sometimes. There’s something delightful about looking up and getting a rain shower or feeling naughty about a wet t-shirt. I am also fond of those moments right after a rain, when the world is bit hushed, the colors are muted, and everything seems bathed in newness. Perhaps we need a little rain sometimes, the soft kind that collects into little pools. It makes for slow time and moments of deliberate intention (or you get your feet wet). A time for noticing trickling raindrops and yellow buildings. When you hear the earth shh-ing you to stillness. When you can squeeze oil out of a flower or tap-dance in a puddle. A day for getting all squishy inside so one remembers wet accidental meetings, or even writing again. hi paula… think i rss–ed awhile back… and i was surprised to get your post in my mail…. it’s nice you’re writing again. Yes! Suddenly, the Muses came back to visit. I hope they stay longer. Hope to see you soon. Are you guys back?